For your convenience, Central Texas Shredding offers customizable recurring shredding services that provide excellent service and peace-of-mind scheduling to make sure that your shredding is a priority month after month. 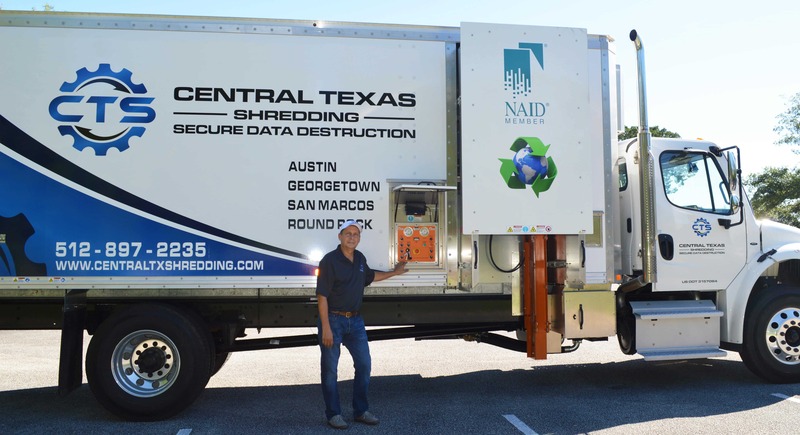 We work with Texas companies in Austin, Georgetown, Round Rock, San Marcos, and surrounding areas, providing local businesses and organizations with a convenient shredding service solution. Having a scheduled shredding service means that your day-to-day paperwork waste, which often contains a lot of private information, will be protected and kept confidential until it is shredded. What Are the Benefits of Scheduled Shredding? With a recurring shredding service, your shredding needs are constantly managed. As part of our service, we will assess your unique needs and provide you with a variety of options for scheduling. This includes providing you with secure collection consoles or specialized totes that will support your needs based on your office layout, employee workflow habits, and industry-specific security requirements. All secure collection containers are provided to your company free of charge. We provide the following shredding service schedules based on your needs. At Central Texas Shredding, we have solutions for every business model, and will work with you to provide a solution that serves all of your organization’s needs. We will work with you and your staff to set up a customized schedule that utilizes the right amount of time in between pickups so that you can get the most for your money. There are no hidden fees at Central Texas Shredding, and contracts are optional for scheduled shredding services. However, if compliance with data protection regulations is non-negotiable, then the execution of a written Business Associate Agreement is required. We’re happy to work with you on this. Written Policies and Procedures. There will be written procedures for the care and protection of you data-bearing documents and media at all times. Employee Training. Each employee must be trained in the proper safeguard of regulated information and breach notification procedures, with written acknowledgment of training. Assign Accountability. Organizations must have an individual responsible and accountable for compliance with data protection regulations. Vendor Selection Due Diligence. Data controllers can be held legally responsible for a data breach resulting from selecting an inadequate information destruction service provider. Business Associate Agreement. Required by law under HIPAA regulations, Data Controllers must have a written BAA in place with third-party destruction service providers. Don’t worry. Central Texas Shredding has you covered. We work hard to ensure that each of our customers has personalized support. We work with companies in a wide range of industries. If you are curious about how we can help your company with shredding services, please complete the form on this page. All the responsibility to comply with these regulations must be supported at the executive level, (Sarbanes Oxley Act). Wondering if we can help your company? Just complete the form on this page or give us a call and let us know how we can help you with your scheduled shredding!